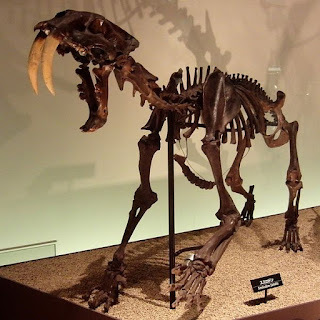 One of the most iconic animals of the Pleistocene, the Saber-toothed Cat (Smilodon fatalis) was abundant throughout North and South America for over 1 million years. We know more about this animal than any other extinct cat thanks to the wealth of material recovered from the La Brea tar pits in Los Angeles, California from which over 2,000 individuals representing nearly every demographic have been identified. It was the last known of North America's giant predators, with the youngest material coming from Nashville, Tennessee just over 9,000 years ago. The name Smilodon is derived from the Greek words smilē, knife, and odous, tooth. 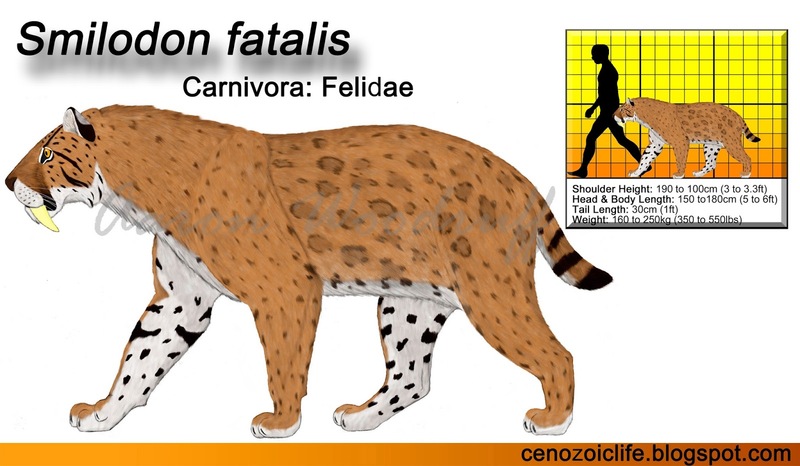 The species name fatalis mean “fatal” or “deadly. Thus, the full binomial name of this species translates as “Deadly Knife-tooth”. The name “saber tooth” refers to the extreme length of the upper canines, which in this species may reach lengths of up to 20cm (8in). Other names have been assigned to North American Smilodon specimens mostly based on geographic location, including S. californicus, S. floridanus, and S. mercerii. However, these now defunct classifications are now recognized as being synonymous with S. fatalis. Saber-toothed Cats appear to have favored open or lightly wooded lowland environments in association with permanent water sources like swamps, marshes, bogs, wetlands, floodplains, rivers, and lakes. Their range is known to have included Canada and much of the United States in the north, and through Central and South America in the south. There is no record of them ever living in the Great Plains and Rocky Mountain regions. This cat could have potentially lived further north as far as present day Alaska during interglacial periods. However, the periodic advancing of the northern ice sheets would have destroyed most evidence of these animals' existence in these northern latitudes. The oldest record of this species dates to about 1.6mya. It was the last known of North America's giant predators, with the youngest material coming from Nashville, Tennessee just over 9,000 years ago. In linear measurements, Saber-toothed Cats were noticeably smaller than Lions (Panthera leo). However, the Saber-tooth was a much more powerfully built animal with particularly robust limbs and a compact body. Though differing in size, the two would have been closely matched in weight with the Saber-toothed Cat averaging 50kg heavier than a Lion of the same head-and-body length. Saber-toothed Cats also differ from Lions in having a much longer and stronger neck, a shortened lower back, and a stubby tail no more than a foot long. The carnassials* were longer and more blade-like, and the upper canines were elongated, laterally flattened, and could grow up to 20cm (8 inch) in length. These were also lined with fine serrations for cutting through flesh. Isotope analyses reveal these specialized killing tools would begin to erupt at 8 to 12 months of age, and reached their full adult length by the time the cats reached sexual maturity at around 2 years. To employ these teeth in a killing bite, Saber-toothed Cats had a maximum gape of around 120°. The overall skeletal anatomy of the Saber-toothed Cat suggests an animal adapted to more actively grapple with the prey animals that were considerably larger than themselves. In comparison, Lions tend to more frequently target prey species that more closely match them in size, only taking to larger prey when smaller animals are scarce or when a particularly large hunting group is involved. Because this species seems to have had an affinity for wet habitats, it is likely to have had a rather dense coat to repel water, especially in winter. Sexual dimorphism* appears to have been less pronounced than it is in modern cats, however, past studies have suggested that males did indeed grow slightly larger than females and possessed more robust skulls. 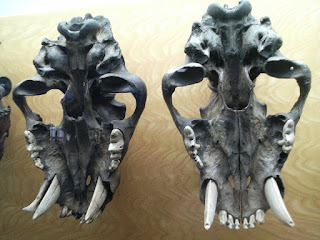 Saber-toothed Cats are famously one of most abundant predator recovered from the Rancho La Brea site in California with over 2,000 individuals identified, second only to the Dire Wolf (Canis dirus) which is represented by over 4,000 individuals. The sheer number of individuals, the frequency and severity of bone injuries, mixed age demographic, and the rate of tooth replacement known from Saber-toothed Cat from this site all strongly suggest that this species was a social predator that lived in family groups perhaps numbering 2 to 6 adults. As with modern cats, it is likely that male and female groupings lived separately from each other most of the time and selected differently sized prey to minimize intraspecific* competition. Both sexes would have occasionally intermingled at larger kills or when the females came into estrus. Male and female groups may have also been compelled to gather in the same locality and sometimes hunt together in response to prey migrations and the tendency of herbivores to congregate in particular areas due to seasonal changes in food and water availability. Like most social animals, Saber-toothed Cats were likely to have been highly vocal with a broad range of short-range and long-range communications, including roars. Saber-toothed Cats appear to have had a preference for the more common, larger herbivores of the Pleistocene such as bison, horses, and large camels. They were also capable of bringing down young mammoths, mastodons, and some of the smaller ground sloths and could have occasionally tackling smaller prey such as deer and capybara. A favorite hunting technique of the Saber-toothed Cat may have been to ambush large herbivores as they came near the water to either drink or wallow. Group members would have strategically positioned themselves in different locations in order to trap prey; for example, one cat may chase the prey within range of two or three nearby partners. They may have also chased their prey into shallow water where their broad paws, powerful limbs, and leaping ability would have afforded them greater mobility over softer substrates than many of their hoofed victims. These hunting strategies are still employed by large cats today. Captured prey would be very swiftly immobilized by the cats’ powerful limbs and dispatched with a single bite to the neck, with the large upper canines severing the major arteries resulting in a very rapid and efficient kill. Dire Wolves are frequently found in the same fossil localities as Saber-toothed Cats, implying that they had the same habitat preferences and likely hunted many of the same prey animals. The smaller size of the wolves, however, means that they were obligated to focus on smaller prey than what the larger cats were hunting. This behavior reduces interspecific* competition, and a similar relationship may be seen among modern African Lions and Spotted Hyenas (Crocuta crocuta). The other large, contemporaneous social predators included the Lion and the Scimitar Cat (Homotherium serum). However, these competitors would have preferred to hunt in higher, drier areas, thus reducing the frequency of encounters. that has become mired in the La Brea Tar Pits. Artwork by Charles R. Knight, 1921. Carnassial: specialized shearing cheek teeth found in terrestrial mammalian predators. Interspecific: referring to members of different species. Intraspecific: referring to members of the same species. Sexual dimorphism: differences in appearance between males and females of a given species. On an interesting note: Isotopic analysis on Smilodon populator in South America (the parts that are further than what the american lion was known to be found in) showed that they hunted animals from and on dry open plains, like lions. Perhaps the wetland habitat of S. fatalis is a sort of way to avoid competition with lions and homotherium. 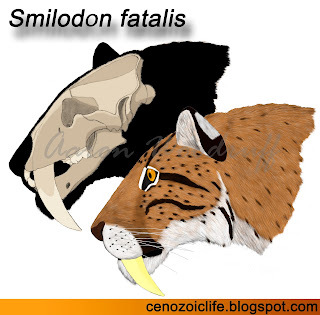 With both absent in south america, smilodon might've filled into that niche. That is very interesting, although I'm not sure if such a find indicates that S. populator was restricted to open environments. Modern Lions are equally as comfortable in dry forests and open woodland as they are on grasslands, and even then they generally like some cover in the form of scattered shrubs or trees (for the shade if nothing else). Think of the Asiatic Lions in India's Gir Forest. But you are right S. fatalis most likely minimized competition with Lions and Scimitar Cats by sticking to wetter lowland areas. Feel free to visit My Website.